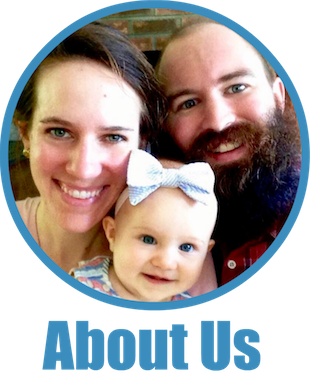 A note to new readers: while we often delve deeply into financial topics (such as Behind the Scenes of a Happy Frugal Marriage and How We Save 65% Annually), we also like to keep it irreverent and downright silly. Because hey, who doesn’t need an investigative interview series conducted by a dog?! And so, I hope you’ll enjoy Frugal Hound Sniffs! If you’d prefer a more, ahem, financial independence-related post, start here. Frugal Hound here. 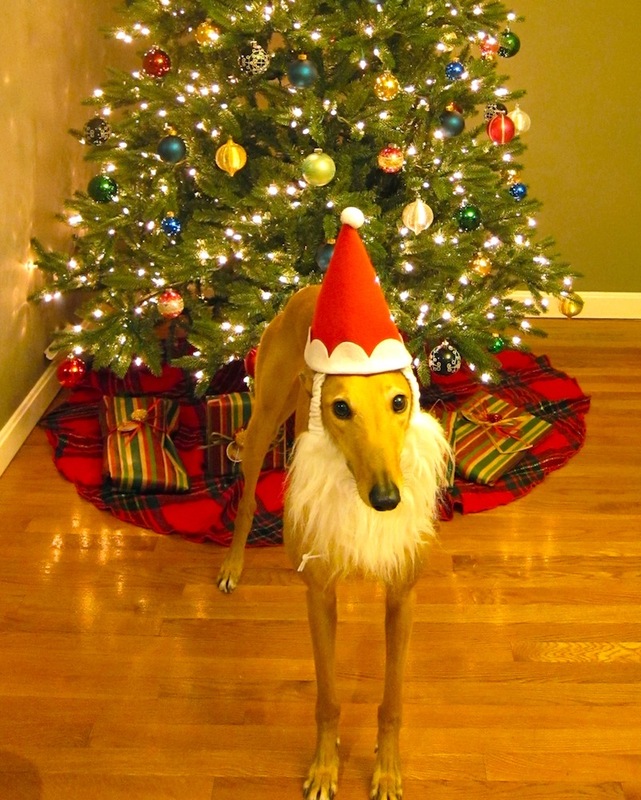 I’m delighted to present a very special greyhound Christmas spectacular edition of my erudite interview series, Frugal Hound Sniffs. Today I introduce you to my look-alike, near-twinsie hound, Maeby of Ridinkulous. Both of our parents have insisted upon dressing us up and posing us in various Christmassy scenes. While Maeby and I are staunchly opposed to clothes on hounds, I couldn’t prevent these photos from being shared here. And so, I hope you’ll join me in exuberantly sniffing Maeby! 1) Who are you? What are you? And who are your parent(s)? I am Maeby, a 7 year old greyhound. You may trace my entire ancestry here if so inclined. I am descended from British racing royalty. 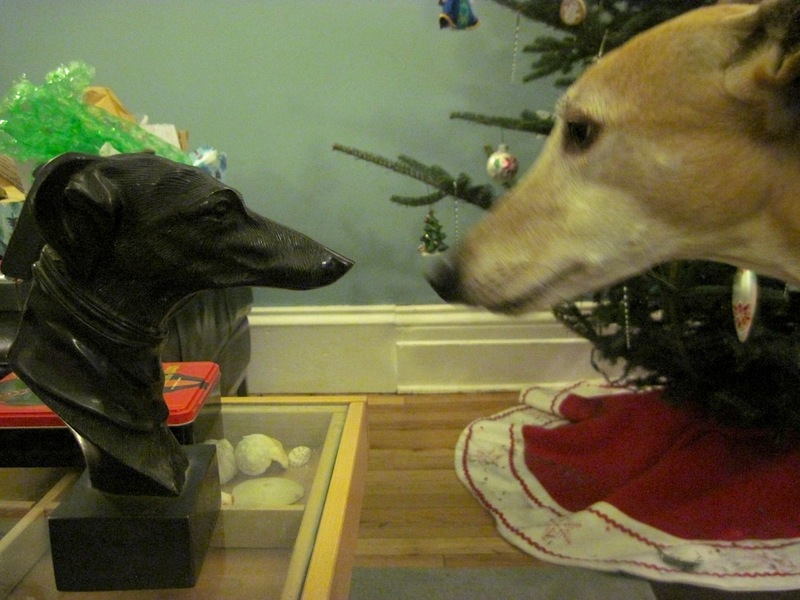 Might we be distant cousins, Frugal Hound? My racing name was not befitting of a lady. I am loath to say it….“Cocktail Dancer.” I ran two races in some very hot locale called “Alabama,” coming in last and next to last. I love a good run in the out of doors, but do not see the point of competition. My favorite activity is sitting on a generously upholstered surface in quiet contemplation. Presently, I live in New York with adoptive parents Norm and Marge, who write the blog Ridinkulous. 2) What frugal tips and tricks does your human use in your pet care regime? Mummy and Daddy do their level best to be as frugal as they can, sometimes to my detriment. Instead of going to the doggie spa, like a lady, I am forced to have my tiny delicate paw nails worn down with, oh it hurts me just to say, a power tool! Oh, and were I to visit the doggie spa for my twice-yearly bath! But more often I am cleaned at home, or even worse, sometimes in a room connected to the side of a car wash. Oh, the indignity. I find that being overly finicky in one’s eating habits does not befit a frugal household. In that spirit, I readily partake in any morsel that finds its way into my dish. I greatly enjoy squeezings from the tuna can, yogurt, crackers, or the very rare times I get to have wet dog food. Toys? You must be referring to my associates, Crabby the crab and Octo the octopus. 5) What’s the most expensive thing you’ve destroyed? I find typical canine “play” activities such as chewing, biting, and fetching quite vulgar. I would never destroy anything of value. Octo, Crabby and I engage in serious conversation and gentle nibbles only. I do occasionally like to borrow the bathmat and Mummy’s shoes. This is a draw. As I usually have more important concerns on my mind, I am often not very, how shall I put this, “spatially aware” and tend to knock into various household items. You see, my ears used to hang symmetrically. One day I swung my head around and hit a table leg. I can’t say for certain that the table was placed there when I wasn’t looking, but I smacked the side of my head so hard that my ear knocked out of place. Mummy was terribly distraught but I felt nary a twinge and went on my merry way quite unharmed. The other embarrassing moment was through no fault of my own. My parents decided I would look fetching in a wig that Daddy had worn to play Charlie Bucket that Halloween. Oh how they chortled at my shame! 7) How often do you get a bath and would you say it’s too often? I adore water and take every opportunity to hop in and lie down. I am a canine dowsing rod on our outdoor excursions and am able to find any stream, lake or puddle in which to lie. Unfortunately these waterways are often not the cleanest, so a few times a year when I get that “not so fresh” feeling I am hosed down with some gentle hand soap. As long as the water doesn’t touch my ears I tolerate it fairly well. 8) What is your family’s financial plan or goals and how do you contribute? Mummy and Daddy plan to pay off all of their debt, including their mortgage, in 2017. I don’t understand why someone would pay extra into their low-rate mortgage every month when the stock market has been doing so well, but what do I know? I am but a dog. I contribute because I am easily entertained. I see the same toys every day and it’s like a surprise every time! I don’t require expensive doggy treats. I am happy with a few crackers, a chunk of meat, or the peanut butter jar that needs to be cleaned out for recycling. I also provide cheap entertainment at the dog park. 9) What is your best skill? I can find the best shoes. 10) BONUS QUESTION–ask and answer any question of your choice! What is my ideal vacation destination? I’m glad you asked. I like to go to the Cape Cod National Seashore. All that wet sand is perfect for running with tiny feet. Plus I can take a dip in the water. I’m afraid of strangers, so I like to go early in the morning when no one is around so I have the beach to myself. One time there was a dead seal washed up on shore! It smelled delectable! Mummy and Daddy screamed so when I came near! What’s my favorite song? I bet you can guess. Oh that wig. Maeby, I feel your pain. Also, I’m quite thankful my parents haven’t ever taken me to see Santa Paws. Looks terrible. My racing name was “Red Kettle” and so, I too, am most grateful that my name has been changed to something much more befitting of a lady. Mrs. Frugalwoods here: Many thanks to Norm from Ridinkulous for helping Maeby submit her charming interview. Ridinkulous is written by Norm and Marge, two weirdo DINKs exploring how to save and spend money more awesomely through analysis, DIY, and frequent flyer miles. 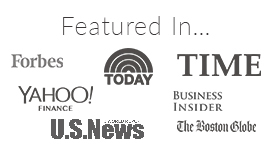 They’re new on the blogging scene, but already have some great writing going on–check them out! Do you have something to share with the internet? If so, answer my Frugal Hound Sniffs: Exclusive Interview Questions and have your parents email them to my mommy: mrsfrugalwoods@gmail.com (I can’t believe they won’t give me my own email account) and you’ll be featured in an upcoming issue! While I know we are more than just our images, please do send photos too. P.S. Follow us on Twitter @FrugalWoods for even more ridiculous photos of Frugal Hound and friends. Maeby likes your cat’s wig, too, Mrs. Pop. Thanks! Good luck, Gretchen! 2017 will be here faster than you think. Thanks! I was very confused why Frugal Hound was interviewing herself when I first clicked over. Another classy greyhound lady 🙂 She looks so happy frolicking and running on the beach! 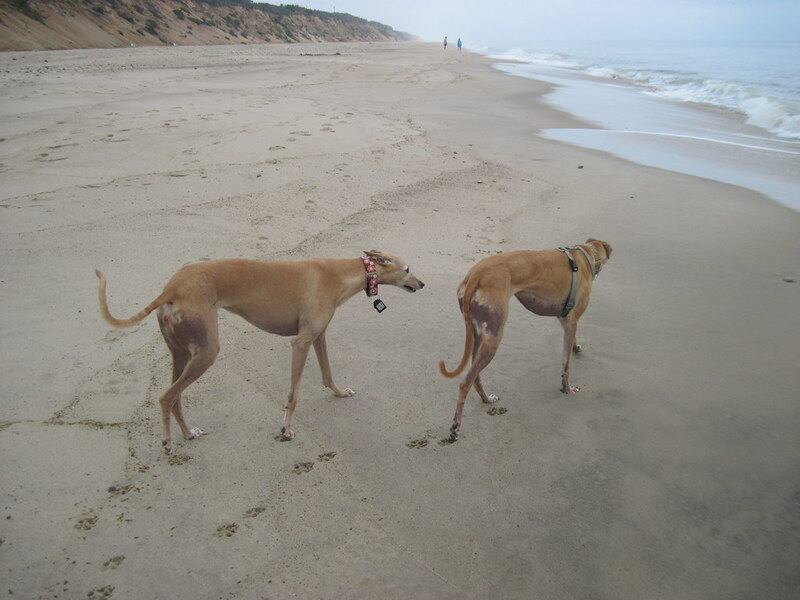 Fun fact: Maeby met yet another twin greyhound on the beach that day, and I could’ve posted pictures of them together, but I thought that just might make people’s heads hurt. 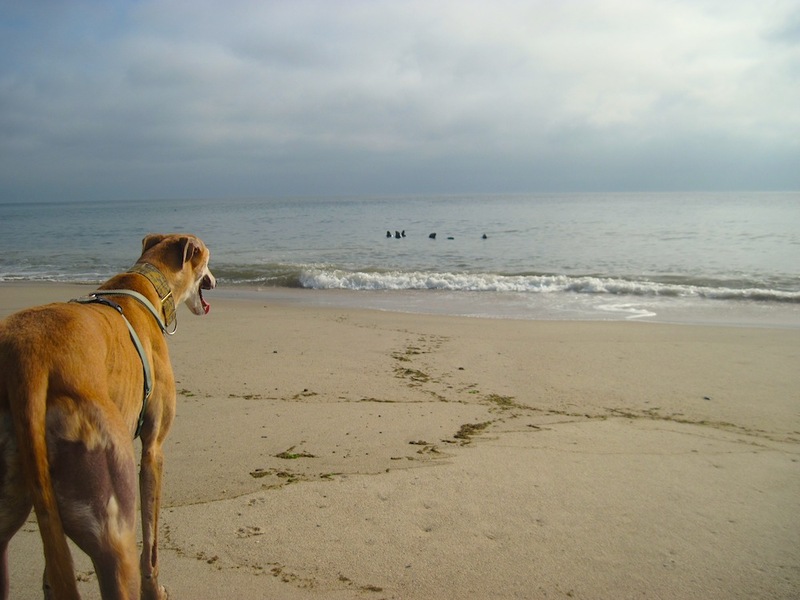 Love the picture of Frugalhound running on the beach, doing what greyhounds do best. The look of pure joy on her face is awesome! Merry Christmas and have a blessed new year. Merry Christmas to you too! 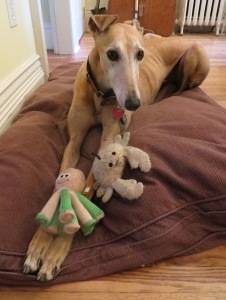 The photo is actually of a different greyhound, Maeby, who Frugal Hound was very excited to interview today :). She and Frugal Hound look almost identical! Funny interview and I see the resemblance of both Santas. Those pictures are classic, Ha Ha. Happy Holidays. 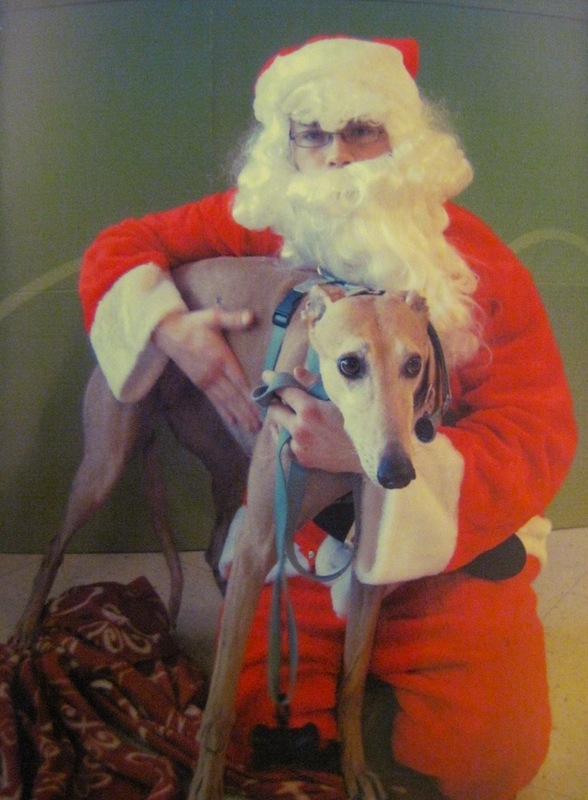 I don’t know which dog was more traumatized–the one dressed up as Santa or the one meeting Santa :). Happy holidays to you too! 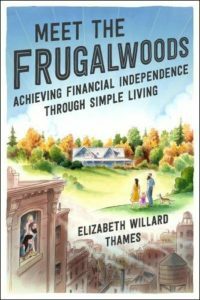 I’ve recently discovered the Frugalwoods and this is my favorite series! Our dog adores the beach just like Maeby! Thank you so much! I’m so glad you found us :). Thanks for saying hi! 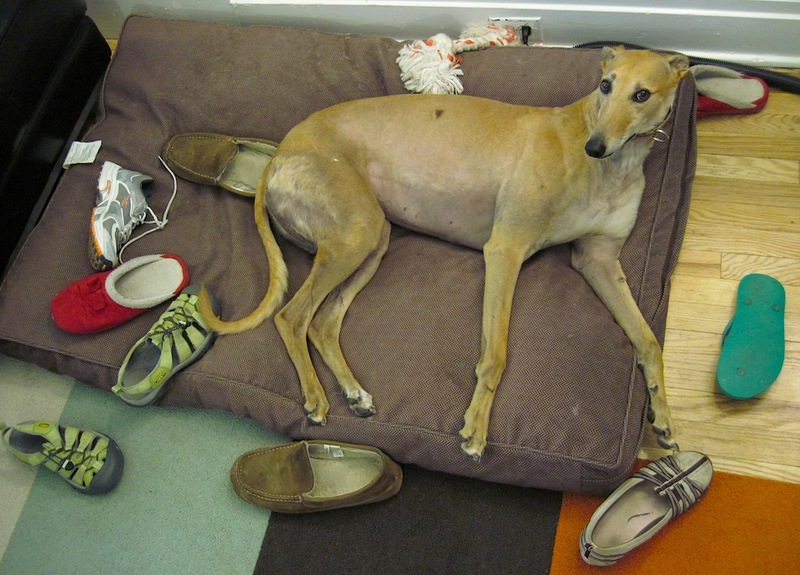 I love the picture of Maeby with all the shoes;0) You will always know where your shoes are! Maeby acts like she’s happy to see us come home, but mostly she’s just focused on stealing our shoes once they come off. And here I thought for sure Maeby’s favourite song would be who let the dogs out. I guess I under estimated her level of sophistication. My apologies. Nice meeting you Maeby! Looks like you and Frugal Hound could be best friends! Dog twins! Too cute!! Happy Holidays! Thanks! Happy holidays to you too :)! Definitely Frugal Hounds twin right here! Super cute. 🙂 I hope you have a Merry Christmas! Totally! Their facial expressions are even pretty similar! I hope you have a wonderful Christmas too, Natalie :)! I am really beginning to love greyhounds! That wig was classic. Nice to meet you Maeby. Yes! I’m slowly converting you… ;)! That wig is beyond hilarious. I love the look on her face too. Maeby is so cute! Twins! Really, crabby the crab and Octo the octopus, those are some of the favorite toys of my niece! Haha! By the way, I am planning to get a greyhound next year! Promise! Greyhounds make wonderful pets, I’m so excited for you :)! 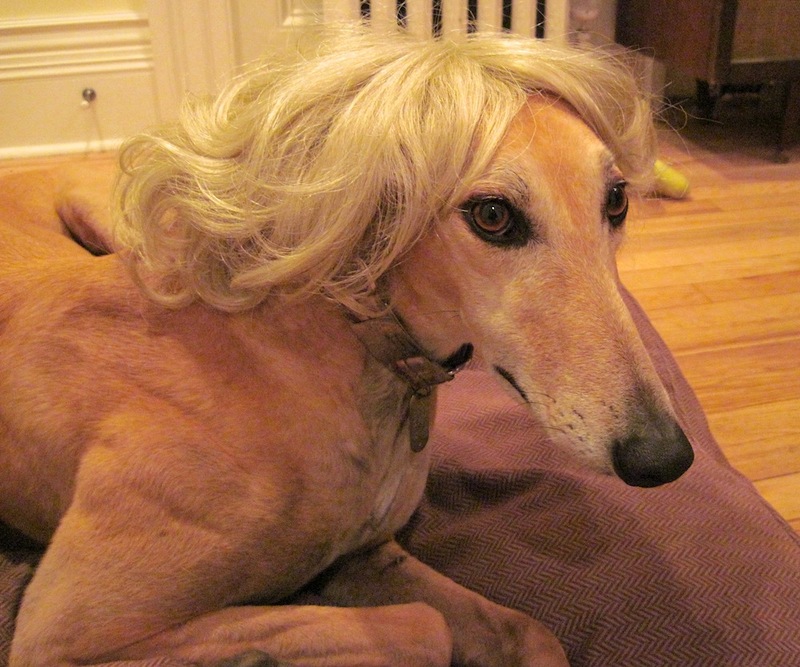 Maeby, you look fabulous as a blonde!!! 🙂 Have a very Merry Christmas, Frugalwoods family! Adorable! Maybe our golden retrievers will have to make a blog appearance some day. And all the best for 2015. She says Happy New Year to you too :)! Haha, I love the shot in the wig! I think Maeby really takes the hound cake in that wig–it’s too cute! What a cute idea! And cute pups…happy holidays! Thanks! We do love sniffing pets here on Frugalwoods ;). Thanks so much for stopping by! Greyhounds really are marvelous pets aren’t they :). Frugal Hound certainly makes us laugh on a daily basis too! Thanks so much for stopping by.